The following building permits were issued during the months of August and September 2018. Ailan Garcia, a minor, through his mother and next friend Idaileen Oyola v. Children’s House Learning Inc.
David Shartrand and Melissa Shartrand v. Pearson Systems Inc. and Universal Electric Co. Inc.
Joseph T. Huckle v. Tree413 Inc.
Leanna Lewis, personal representative of the estate of Serena Lewis v. Eilean Attwood, M.D. ; Danielle Granieri, D.O. ; Asra Jawed, M.D. ; and Heather Sankey, M.D. Christine Antonuzzo, personal representative of the estate of John Antonuzzo v. John Romanelli, M.D. and Mouhanad Ayach, M.D. Marie Martin, personal representative of the estate of Celeste Lucille Davignon v. Sunshine Village Inc.
Humphrey Co. Inc. f/k/a Holden Humphrey v. Turn Key Lumber Inc.
Patrick Smith v. Triple G Scaffold Services Corp. and NEI General Contracting Inc.
Robin Bassell and Aaron Bassell v. Peter Pan Bus Lines Inc. and Joseph Anderson Jr.
• July 31: Entrepreneurial Meet-up, hosted by Shire Breu Hous, Dalton. • July 30: 15th Annual Golf Tournament, hosted by Orchards Golf Club, South Hadley. Schedule: 10:30 a.m.: registration, putting contest, and light lunch; noon: shotgun start, scramble format; 5 p.m.: social hour and cash bar; 6 p.m.: dinner and awards ceremony. Hole-in-one, longest-drive, and closest-to-pin contests. Cost: $150 per player, $600 for a foursome. To register, visit www.amherstarea.com/events/details/2018-golf-tournament-19060. • Aug. 30: Candidate Debate, 7 p.m., hosted by Amherst Regional Middle School auditorium. A pre-primary debate for candidates seeking the Democratic nomination for state representative (Third Hampshire) and state senator (Hampshire, Franklin, Worcester). • Aug. 16: European Café & Open House, 4:30-7 p.m., hosted by Chicopee Chamber of Commerce & Courtyard, 264 Exchange St., Chicopee. Come enjoy a taste of the European flavors of the local restaurants, all in a relaxed setting with the musical stylings of Sergio D’Orsini. 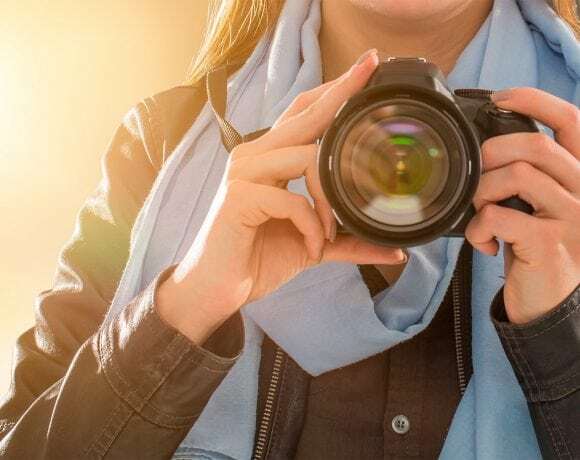 Meet and greet the local artists and tour the Chamber of Commerce and engage with many small business owners, including MaryKay, Herbarium, Lemon Grass Fitness, and TrueHeart Wellness, to name a few. Presented in partnership with Westfield Bank. Cost: $25 for one attendee, $40 for two attendees (must be purchased at the same time). Sign up online at www.chicopeechamber.org/events or call (413) 594-2101. • July 25: West Meets West at the Ranch Networking Event, 5-7 p.m., hosted by the Ranch Golf Club in Southwick. Join us as we pair up with the Greater Westfield Chamber for an evening of games, fun, networking, and food. These events bring members and non-members together to network in a laid-back atmosphere. Cost: free for members, $10 for non-members. For more information about this event, contact the chamber office at (413) 426-3880, or register online at www.westoftheriverchamber.com. • Aug. 6: 15th Annual Scholarship Golf Tournament, hosted by the Ranch Golf Club in Southwick. Schedule: 11:30 a.m.: registration; noon: lunch; 1 p.m.: shotgun start, scramble format. Putting contest, 15th hole air cannon, Carrabba’s Cuisine Hole, and more. Cost: $125 for golf and dinner. For more information and tickets to this event, contact the chamber office at (413) 426-3880 or [email protected], or register online at www.westoftheriverchamber.com. • Aug. 16: Free Membership Appreciation Luncheon, noon to 1:30 p.m., hosted by Carrabba’s Italian Grill, Riverdale Street, West Springfield. Lunch is on us! Members can register for this networking event and bring a non-member guest, and you both enjoy a free lunch. Seating is limited, so register at www.westoftheriverchamber.com before it’s too late. For more information, contact the chamber office at (413) 426-3880. Comcast announced the appointment of Daniel Bonelli as vice president of Finance for the company’s Western New England Region, which includes more than 300 communities in Connecticut, Western Mass., New York, Vermont, and Western New Hampshire. In this role, Bonelli will oversee all financial operations, including finance and accounting, warehouse and materials, information technology, facilities, security, fleet management, and environmental health and safety. Bonelli began his career with Comcast in the Western New England Region in 2007 as a financial analyst. He quickly progressed to manager and then director before being promoted to senior director of Finance in 2014. In 2016, he relocated to the Philadelphia area, where he served as senior director of Finance for one of Comcast’s largest regions, overseeing a team of 60. Bonelli graduated with a bachelor’s degree in finance from Central Connecticut State University. The Women’s Fund of Western Massachusetts (WFWM) announced that Rania Kfuri and MaryLynn Murray have joined its Board of Directors. They will each serve a three-year term. Kfuri currently works as the Communications and Partnerships officer for the Solidago Foundation. Throughout her life experiences, she has worked to support educational opportunities and access to resources that improve the lives of women and girls. She has a professional background in international development, with a master’s degree in ethics, peace, and global affairs from American University in Washington D.C. Murray is vice president for Commercial Lines and Sales at the Insurance Center of New England. She holds an MBA with a concentration in human resources and has been employed in the insurance industry since 2002. She previously served on the board of the Agawam Small Business Assoc. and on the Women’s Fund marketing committee. In addition, new officers elected include Haydee Lamberty-Rodriguez as board president (formerly vice president), Leigh Rae as vice president (formerly board clerk), and Pia Kumar as clerk. Layla Taylor, immediate past board president, will remain on the board through June 2019. 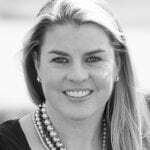 Valley Venture Mentors CEO Liz Roberts announced that she will be leaving her position as of July 13, at which time current chief operating officer Kristin Leutz will take the helm of the organization that has been dedicated to nurturing entrepreneurship in Western Mass. 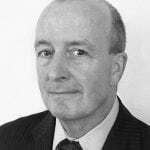 Roberts plans to depart after a period of growth for Valley Venture Mentors (VVM). During her tenure, she launched the Startup Accelerator program, in which entrepreneurs receive five months of training, mentoring, office space, and access to equity-free funding. Entrepreneurs who graduated from all VVM programs generated $51 million in revenue and fundraising during the past three years, and created 500 full-time and part-time jobs over the course of 2017. The Startup Accelerator program earned recognition as a model rural accelerator by the Obama administration. Prior to joining Valley Venture Mentors as COO in 2017, Leutz served as vice president for Philanthropic Services at the Community Foundation of Western Massachusetts, where she helped create programs such as Valley Gives. Leutz also aided entrepreneurs at VVM as a volunteer mentor for many years before joining the team. She has had a career in global philanthropy and business leadership spanning organizations like MassMutual and RefugePoint, a Cambridge- and Nairobi-based, globally recognized social-impact startup. She has led operations, fundraising, and marketing, and brings decades of experience to her role at VVM. 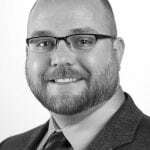 Springfield College announced that Patrick Love will serve a two-year interim appointment as vice president for Student Affairs and program director of the Student Personnel Administration (SPA) program, effective Aug. 6. The college will resume a national search for both positions in 2020. Love will serve as a member of the president’s leadership team in his role as VP for Student Affairs and will work closely with the leadership of the Division of Academic Affairs in his role as SPA program director. He brings to Springfield College a career in higher-education leadership and teaching, spanning managerial work in student affairs and academic affairs, and as a professor in Student Affairs. He is a lifelong educator who focuses on growth, development, and transformation. He is also an experienced writer, author, speaker, coach, and trainer on leadership and management development. He has consulted with or spoken at more than 40 colleges and universities, was a tenured professor at two research universities, and is nationally known for his innovative approaches to management as well as a commitment to student education and development. He is active in both the American College Personnel Assoc. and the National Assoc. of Student Personnel Administrators. Most recently, Love was executive in residence at Bowling Green State University, serving as senior lecturer. Previously, he was vice president for Student Affairs at New York Institute of Technology, associate vice president for Student Affairs at Rutgers University, associate provost for Student Success at Pace University, co-director of the Higher Education Program at New York University, and director of the Master’s Higher Education Program at Kent State University. Greenfield Savings Bank (GSB) announced four team members for its new Hadley office: Hector Toledo, Jocelyn Walsh, Jacqueline O’Connell, and Joseph Dallair. Toledo has been named office manager of the new Hadley office. He joins Greenfield Savings Bank with 28 years of experience in banking. In his role as manager, he will concentrate on business development, in addition to managing the operations of the Hadley Office. 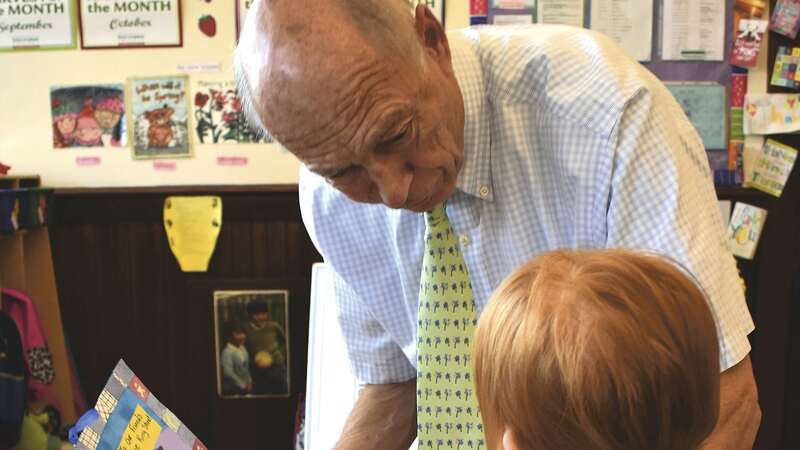 Among his volunteer roles for numerous local nonprofit organizations, Toledo is a board member and chair of the finance committee of Baystate Health and a member of the board of the Food Bank of Western Massachusetts. He has previously chaired the board of Springfield Technical Community College and served as a board member of both the YMCA of Greater Springfield and the United Way of Pioneer Valley. Walsh has been promoted to the Hadley office as a super banker. GSB super bankers are customer-service professionals who can assist customers with a wide range of banking services, including account openings, online and mobile banking, as well as account transactions. 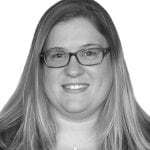 Before joining the staff in Hadley, she worked for GSB at the Shelburne Falls office for more than two years. O’Connell has joined the staff of the Hadley office as a super banker. She has worked for GSB for more than three years at the Amherst office on University Drive. 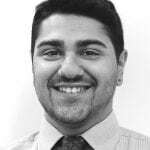 Dallair has joined the staff of the Hadley office as a teller. Prior to joining the team at Greenfield Savings Bank, he worked for three years in customer-service positions in other industries. He began working at GSB in 2017 as a teller in the Greenfield office. Kimberley Lee, a recognized leader in the nonprofit sector of the Western Mass. region, has joined the staff of MHA, a nonprofit provider of residential and support services to people impacted by mental illness, developmental disabilities, substance abuse, and homelessness. Lee is taking on the newly created role of vice president of Resource Development and Branding for MHA. Lee previously served in communications and development roles in several local nonprofit organizations, including CHD, Square One, the Basketball Hall of Fame, and the Community United Way. She has advanced these organizations and the people they serve with an active voice in the community and through vigorous advocacy achieved by constant policy influence at the local, community, and state level. A lifelong resident of Western Mass., Lee earned her bachelor’s degree in mass communication from Westfield State College. River Valley Counseling Center (RVCC) named Anna Dyrkacz to be its director of Finance. She was appointed to the position last month by Rosemarie Ansel, RVCC’s executive director. Dyrkacz has more than 17 years experience in the healthcare and human-services industry and came to River Valley Counseling Center from a leadership position at Pathlight. She has also held leadership positions at Southgate Retirement Community, Cooley Dickinson Hospital, and Kindred Healthcare of Springfield. 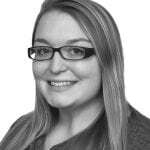 She has a bachelor’s degree and MBA from Western New England University, majoring in finance. Florence Bank promoted Jeremy Melton to the position of first vice president/Risk Management, Compliance and Community Reinvestment Act (CRA) officer. Melton joined Florence Bank in 2012. Prior to his recent promotion, he served as vice president/Risk Management, Compliance and CRA officer. Melton supports his community as the board chair and finance/audit committee member at Tapestry. He also serves as a board member for the Western Massachusetts Compliance Assoc. Mary Ann Coughlin, associate vice president for Academic Affairs at Springfield College, was recently awarded the John E. Stecklein Distinguished Member Award from the Assoc. for Institutional Research (AIR). The award recognizes an individual whose professional career has significantly advanced the field of institutional research through extraordinary scholarship, leadership, and service. Coughlin has a long-standing relationship with the AIR, including serving as a past president and as a trainer for national workshops sponsored by the association. In 2012, she was the recipient of the Assoc. for Institutional Research Outstanding Service Award, recognizing her professional leadership and exemplary service to AIR and for actively supporting and facilitating the goals and mission of the association. During her tenure at Springfield College, Coughlin has served in a variety of positions, including faculty member, president of the faculty senate, and her current administrative position in Academic Affairs. Coughlin worked as a professor of Research and Statistics at the college prior to moving into administration. In her current role, she supervises academic support services and provides leadership for program review, outcomes assessment, faculty development, student success initiatives, and institutional research. The Rotary Club of Springfield elected its new President, Susan Mastroianni, and board of directors at its recent meeting.Originally from the Bronx, N.Y., Mastroianni worked in Springfield for more than 26 years, first as media director for FitzGerald & Robbins Advertising and then as a partner and director of Media Services at FitzGerald & Mastroianni Advertising in Springfield, which closed in 2016. She has been a member of the Rotary Club of Springfield since May 2006. In addition to being president, she chairs the club’s publicity committee also serves as vice president of the board of directors for the Gray House in Springfield. She is a graduate of Marist College in Poughkeepsie, N.Y., with a bachelor’s degree in communication arts. Every year, the Massachusetts Commission on the Status of Women asks every state legislator to nominate someone from their district as an “Unsung Heroine.” For state Rep. Aaron Vega, this year’s pick was Debbie Flynn-Gonzalez, program director at the Gándara Center’s Hope for Holyoke peer-recovery support center. Flynn-Gonzalez began her career in social work as a mental-health clinician performing outreach work in Holyoke 24 years ago before her personal background in recovery led her to work with the recovery community. She launched the first peer-recovery program for pregnant and parenting women in Holyoke and led that program for eight years. She has been program director for three years at Hope for Holyoke, which has 300 active members, with an average of 50 people accessing the center daily. 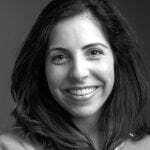 Flynn-Gonzalez earned her bachelor’s degree in social work at UMass Amherst and her master’s degree in counseling and psychology from Cambridge College. The United Way of Pioneer Valley announced that Kathryn Dube is serving as interim president and CEO as the board of directors conducts a search for a new CEO. Dube is a former chairman and vice chairman of the board at United Way of Pioneer Valley and has served as chairman to a number of United Way of Pioneer Valley committees. Most recently she was employed as senior advisor for the United Way of Pioneer Valley since her retirement in December 2017 and was recognized as United Way Volunteer of the Year in 2014 and 2015. Prior to retirement, Dube was a senior vice president of Retail Banking and Wealth Management at TD Bank and Berkshire Bank. KeyBank recently announced the addition of new retail leaders in markets across Connecticut and Massachusetts. 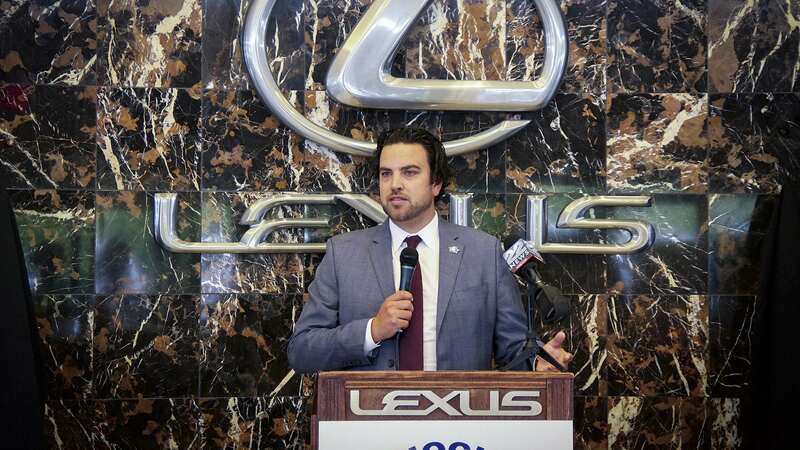 Locally, Brandon Ojakian joined KeyBank with the title of vice president and area retail leader in the Northern Conn. and Western Mass. markets. 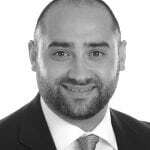 Ojakian has 20 years of experience in the banking and finance industry. 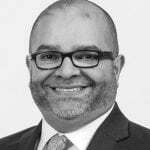 He joins KeyBank from Santander Bank, where he served as a district executive leading branch teams in Connecticut, Massachusetts, and Rhode Island. Prior to Santander, he led several retail regions for Citizens Bank. He holds a bachelor’s degree from Albertus Magnus College. SPRINGFIELD — The Springfield Thunderbirds were honored by the American Hockey League with four Team Business Service awards at a gala reception during the board of governors’ annual meeting at Hilton Head Island, S.C. As part of its Team Business Services program, the AHL honored one club from each conference for top revenue growth in four areas during this past season: overall ticket sales, season-ticket sales, group-ticket sales, and corporate sponsorship sales. For the 2017-18 season, the Thunderbirds took home two Awards of Excellence in the areas of season-ticket sales growth and corporate sponsorship sales growth. This marked the second consecutive season that Springfield captured these awards. These awards came just weeks after the Thunderbirds received numerous honors at the 2018 AHL Marketing Meeting presented by ExteNet Systems in Des Moines, Iowa. At that meeting,the Thunderbirds received the AHL award for Most Unique Community Relations Promotion. This past March, Thunderbirds player Eddie Wittchow approached team management with the idea of presenting loyal season ticket holder Katrina King with specialty glasses that would allow Katrina, a legally blind fan, to have the ability to see the action — through her own eyes — for the first time in her life. Springfield was also recognized for achieving a greater-than-15% increase in per-game full-season equivalents, a statistic that tracks the combined sales of all ticket packages. 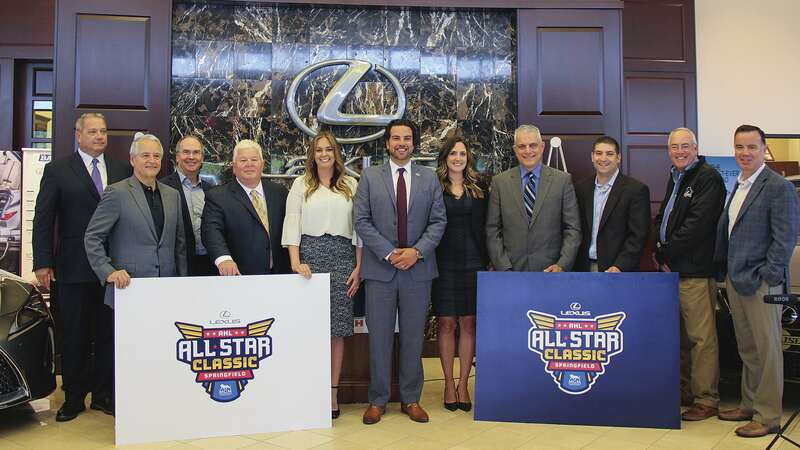 The Thunderbirds’ corporate sales team also was recognized for having a greater-than-15% growth in corporate cash sponsorships generated in the market. The organization also was honored for reaching the benchmark of a greater-than-15% growth in per-game group-ticket-sales revenue for a second straight season. On an individual level, Thunderbirds Senior Account Executive Matthew McRobbie beame the first Thunderbirds sales representative to be recognized as the Eastern Conference’s Top New Season Ticket Sales Executive. HOLYOKE — PeoplesBancorp, MHC, the parent company of PeoplesBank, both of Holyoke, and First Suffield Financial Inc., the parent company of the First National Bank of Suffield, both of Suffield, Conn., jointly announced that they have entered into a definitive merger agreement for PeoplesBancorp to acquire First Suffield Financial and PeoplesBank to acquire the First National Bank of Suffield. The parties anticipate the transaction will close in the fourth quarter of 2018 or the first quarter of 2019. Under the terms of the agreement, shareholders of First Suffield Financial Inc. will receive $12,001.85 in cash per share, representing a total transaction value of approximately $60 million. The merger consideration represents approximately 202% of the First National Bank of Suffield’s tangible book value at March 31, 2018. The transaction is subject to customary closing conditions, including the receipt of state and federal regulatory approvals and approval by the shareholders of First Suffield Financial Inc. In 2017, PeoplesBank donated almost $1 million to area nonprofits. Its employees devoted more than 15,000 hours to volunteer work over the past two years, and 48 of the bank’s officers serve on the boards of directors and committees of 115 nonprofit organizations in the area. Upon completion of the transaction, PeoplesBank will expand its community-development efforts in Suffield and the surrounding Connecticut communities. The combined organization will have approximately $2.8 billion in assets and $1.9 billion in deposits. Upon completion of the transaction, one current member of the board of directors of First Suffield Financial will be appointed to serve as a member of the board of trustees of PeoplesBancorp and the board of directors of PeoplesBank. Following completion of the merger, the current branches of the First National Bank of Suffield will remain open and will conduct business under the trade name First Suffield Bank, a Division of PeoplesBank. PITTSFIELD — Berkshire Community College (BCC) has been awarded $5.5 million for a major project that will transform the first floor of the Field Administration building into a One Stop Student Success Center, transforming the student experience by making the entire admissions and enrollment process easier. The project will renovate the first floor of the Field Administration building, which currently houses Enrollment Management, Advising, Career and Transfer services, Financial Aid and Student Accounts, and Admission and the college registrar. BCC is currently completing $34 million in campus projects for the renovation of Hawthorne and Melville halls, including a connector with upper and lower courtyards, paving of the parking lots and access roads, and installing a community turf field for football, soccer and lacrosse. GREENFIELD — MassDevelopment has issued a $1.9 million bond for CJBW Stamp, LLC, the real-estate arm of Valley Steel Stamp, which will use bond proceeds to construct a 17,500-square-foot building in the Greenfield Industrial Park that the company will then lease. The new building will be next to an existing 27,500-square-foot building that Valley Steel Stamp also leases and has reached full capacity. When completed, the new building will accommodate additional equipment needed to fulfill customer orders. The project is expected to create nine jobs and support 13 construction jobs. GSB Securities Corp., an affiliate of Greenfield Savings Bank, purchased the bond. Valley Steel Stamp was founded in 1971 by William Capshaw as a two-man operation that produced custom-made steel-marking stamps. Over the years, William’s son, Steven, has expanded and diversified the company’s product line to now include general machining and tooling for customers in the aerospace, defense, and firearm industries. Valley Steel Stamp’s facility in Greenfield is a world headquarters for more than 50 highly skilled precision machinists serving over 300 companies in 10 countries. MassDevelopment previously issued bonds to support the purchase and expansion of this facility in 2008 and 2012. WEST SPRINGFIELD — Normandeau Technologies Inc. (NTI) attended the National Assoc. of School Resource Officers in Reno, Nevada in June. The annual, one-week NASRO conference brings together SROs from throughout the U.S. and international locations to meet, discuss the current state of school safety, and receive updates and training on the latest issues surrounding school-safety policy and procedures for school-based law-enforcement officers. NTI has undertaken a program to introduce the StaffAlerter Emergency Notification System (ENS) to school districts throughout the New England area. In association with this endeavor, Brett Normandeau, president and owner of NTI, is positioning the StaffAlerter with organizations associated with K-12 education, including NASRO. StaffAlerter is an ENS and cloud-based systems control. Any teacher or staff can press a button on a wi-fi personal access device and send a notification to thousands of people, lock doors, sound alarms, and page over loudspeakers. NASRO national leadership spent time with NTI to see and hear about StaffAlerter and were impressed and positive with their feedback, he added. NTI is looking to attend future SRO regional and national meetings as both exhibitor and presenter. WINDSOR LOCKS, Conn. — The Connecticut Airport Authority (CAA) announced that the credit-rating agency S & P Global Ratings has raised Bradley International Airport’s rating on its general airport revenue refunding bonds from ‘A’ to ‘A+’ with a stable outlook. S & P Global Ratings assigns a credit rating for Bradley International Airport’s public debt obligations. Some of the factors taken into account during the rating process include the airport’s strong financial and risk-management practices, steadily improving liquidity, low and declining debt burden, strong origin and destination base, diverse service-area economy, airline diversity, and increasing number of enplanements and positive trends. SPRINGFIELD — The Advertising Club of Western Massachusetts’ trustees of the Order of William Pynchon announced their selection of four local residents as recipients of this year’s Pynchon medal. “Our choice of these four remarkable individuals represents a collective concern and dedication to the past, present, and future of our region,” said Mary Shea, chairman of the Pynchon trustees. Slated to receive the Advertising Club’s Pynchon Medal on Oct. 18 at the Log Cabin in Holyoke are: Craig Carr, one of the original incorporators of the Ronald McDonald House of Springfield; Sally Fuller, a tireless advocate for early childhood literacy; Robert McCarroll, a noted historic preservationist; and Ronald Weiss, who was instrumental in the creation of the Community Foundation of Western Massachusetts. The Advertising Club confers the Order of William Pynchon and the Pynchon Medal upon citizens of Western Mass. who have rendered distinguished service to the community. Recipients are nominated each year by members of the community, and are chosen by unanimous decision of the Pynchon trustees, who are Ad Club’s current and five past presidents. BOSTON — Confidence among Massachusetts employers weakened considerably during June as tariffs, rising raw-material costs, and approval of paid family and medical leave in the Bay State raised concerns about business growth. The Associated Industries of Massachusetts (AIM) Business Confidence Index dropped 5.3 points to 61.3 last month, its lowest level since August 2017. Confidence remains well within the optimistic range, but the June decline left the BCI slightly below its level of a year ago. Though analysts say the volatility in business confidence during May and June may reflect some statistical anomalies, the comments provided by employers on the monthly AIM survey suggest that companies are becoming increasingly concerned about a perfect storm of issues on the federal and state levels. The constituent indicators that make up the overall Business Confidence Index all lost ground during June. The Massachusetts Index assessing business conditions within the Commonwealth fell 7.2 points to 62.8, leaving it 1.4 points lower than in June 2017. The U.S. Index ended the month at 60.0, down 9.3 points for the month but 2.6 points better than a year ago. The Current Index, which assesses overall business conditions at the time of the survey, declined 2.6 points to 63.5. The Future Index, measuring expectations for six months out, fell 7.5 points to 59.1. The Current Index gained 1.6 points during the year, while the Future Index lost 2.6 points. Employer views of their own companies also weakened. The Company Index declined 3.3 points to 61.2, down 1.2 points for 12 months. The Employment Index ended the month at 55.0, a 3.3-point decrease for the month and 3.1 points lower than a year ago. The Sales Index lost 2.9 points for the month and 0.2 points for the year. Manufacturing companies (62.5) were slightly more optimistic than non-manufacturers (60.2). Companies in the eastern part of Massachusetts (63.3) were more bullish than those in the west (58.7). BOSTON — The Baker-Polito administration and MassDevelopment announced $2,155,000 in funding for the third round of Collaborative Workspace Program grants, a MassDevelopment program that accelerates business formation, job creation, and entrepreneurial activity in communities by supporting infrastructure that fuels locally based innovation. 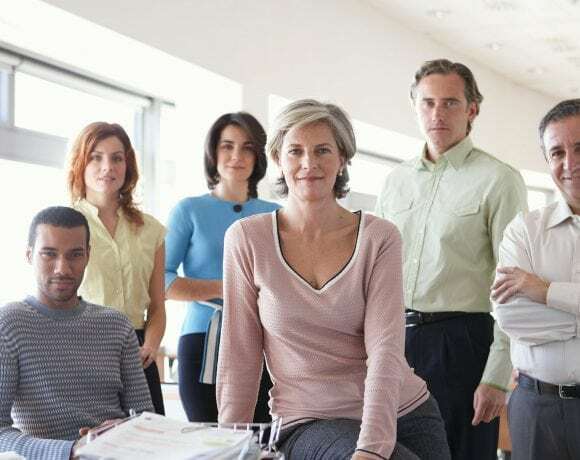 Eligible organizations may apply for either seed grants to plan and study the feasibility of new collaborative workspaces, or fit-out grants to develop and expand existing workspaces. Through its first two rounds of grants, the Collaborative Workspace Program provided $3 million in funding to more than 50 organizations for the planning, development, and build-out of different types of collaborative workspaces. This new round includes $1.5 million from the Commonwealth’s capital budget and $655,000 from the Barr Foundation, the second installment of a three-year, $1,965,000 grant to the program to expand support for arts-related collaborative workspaces in the Commonwealth. Funding decisions are expected to be announced at the end of September. BOSTON — The state Department of Transportation recently awarded five grants totaling more than $1.8 million as part of the Industrial Rail Access Program (IRAP), which helps increase rail and freight access, economic opportunity, and job growth. IRAP is a competitive, state-funded, public/private partnership program that provides financial assistance to eligible applicants to invest in improvement projects in rail infrastructure access. State funding for these five projects will be matched by more than $2.4 million in private funds. Locally, $500,000 was awarded to the Western Recycling rail-spur project in Wilbraham. The project will allow an existing solid-waste-handling facility to load outbound waste into rail cars for shipment to out-of-state landfills. With the restoration of rail service to the site, the facility will start processing municipal waste, in addition to construction and demolition debris. The project includes the construction of one loading track and five storage tracks for a total of 6,000 feet of new track. With completion of the project, the facility will be served by more than 1,500 rail cars each year, eliminating 7,500 regional truck trips each year and supporting the creation of eight to 10 additional jobs at the facility. IRAP provides grants to railroads, rail shippers, and municipalities that identify a public benefit gained through improved rail transportation usage or economic growth that would be realized through improved access to rail assets. The other four grants went to projects in Littleton, Peabody, and Upton. BOSTON — A new, statewide study of marijuana use among Massachusetts residents found that about 21% of adults had used marijuana in the past 30 days, and the proportion of marijuana use was highest among 18- to 25-year-olds. The study, conducted by the Massachusetts Department of Public Health (DPH), was mandated by the Legislature as part of its revisions to the 2016 adult-use marijuana law. The purpose of the study was to investigate the patterns of use, methods of consumption, and general perceptions of marijuana; incidents of impaired driving and hospitalization related to marijuana use; and the economic and fiscal impacts for state and local governments. Among the study’s other highlights, smoking is the most common method of marijuana consumption, although more than 40% of marijuana users report using multiple methods of use. More than half of adults perceive marijuana to have slight or no risks and use marijuana for non-medical purposes. A survey of patients who use marijuana products for medical use suggests that the average person uses marijuana 24 days a month, with the majority using marijuana products for at least 21 out of the past 30 days. Among respondents that use marijuana, 34.3% reported driving under the influence. Overall, 7.2% of the adult population drove under the influence of marijuana in the past 30 days, and 11.3% of adults rode with a marijuana-using driver in the past 30 days. This is similar to estimates from a survey of medical marijuana patients that found approximately 10% of respondents drove under the influence in the past 30 days. The number of marijuana-related calls to the Regional Poison Control Center in Massachusetts has been increasing over time. The calls include incidents of unintentional exposures among children, with the majority of calls related to 10- to 19-year-old individuals, and/or exposure to dried marijuana flower. The proportion of calls increased after medical marijuana was available in the Commonwealth. Economic projections suggest that marijuana will increase Massachusetts state revenue by about $215.8 million in the first two years of retail sales. The increase will largely come from sales and excise taxes collected on retail purchases. Based on experiences from states with existing legalized adult use, sales-tax revenue is expected to be higher in the second year ($154.2 million), as compared to the first year ($61.6 million). SPRINGFIELD — During its Grow with Google tour in Springfield, Google announced a sponsorship for FutureWorks Career Center totalling $100,000. The sponsorship will help FutureWorks deepen its available resources to prepare active job seekers with the digital skills necessary to obtain jobs and succeed in the workforce. FutureWorks will deploy Google’s Applied Digital Skills Curriculum its diverse group of youth and adult job seekers over the course of a year. Some of its staff will also be trained on Google for Jobs and teach active job seekers how to use the online platform to streamline their job search. Launched in October 2017, Grow with Google is the tech company’s new initiative to help create economic opportunities for Americans. The project is an extension of Google’s long-standing commitment to making information and technology accessible to everyone, and focuses on providing digital skills and learning opportunities to communities across the U.S.
Rayonia Inc., 132 Glendale Road, Agawam, MA 01001. Rajesh Rayonia, same. Restaurant. RHI Enterprises Inc., 15 Jones Road, Deerfield, MA 01342. Thomas E. Sjodahl, same. Medical equipment sales and service. Spruce Hill Hospitality Inc., 239 Russell St., Hadley, MA 01035. Shardool S. Parmar, same. Operation of hotel. ST Inspired Inc., 124 Shore Drive, Hinsdale, MA 01235. Wayne Zaniboni, same. Online retail sales. Supporting Resilient Communities Inc., 29 Paradise Lake Road, Monson, MA 01057. Morgan E. O’Neill, same. Provides aid to the needy and stressed worldwide to relieve human suffering that maybe caused by natural or civil disasters and to relieve emergency hardships through the use of proven state-of-the-art technology. The Center for Love and Hope, Sant Pou Lanmou Ak Lespwa Incorporated, 50 1/2 Williams St., North Adams, MA 01247. Caitlin Mcconnell, same. The purpose of this corporation is to inspire hope by meeting both tangible and spiritual needs of the communities we serve. Ridgeline Builders Inc., 243 Churchill St., Pittsfield, MA 01201. Aaron Rocha, same. General contracting and construction services. Serres Inc., 1500 Main St., Suite 2700, Springfield, MA 01115. Mika Hagberg, same. Sales and marketing of medical devices. Sweet and Savoury On Main Inc., 31 Main St., Stockbridge, MA 01262. Livia M. Landry, 16720 Hollow Tree Lane, Wellington, FL 33470. Bake shop. Sierra Bar and Grill Inc., 31 Hillcrest Circle., Westfield, MA 01085. Carmine Capua, same. Full service restaurant and bar. The following business certificates and trade names were issued or renewed during the month of July 2018. RPM Wood Finishes Group Inc. 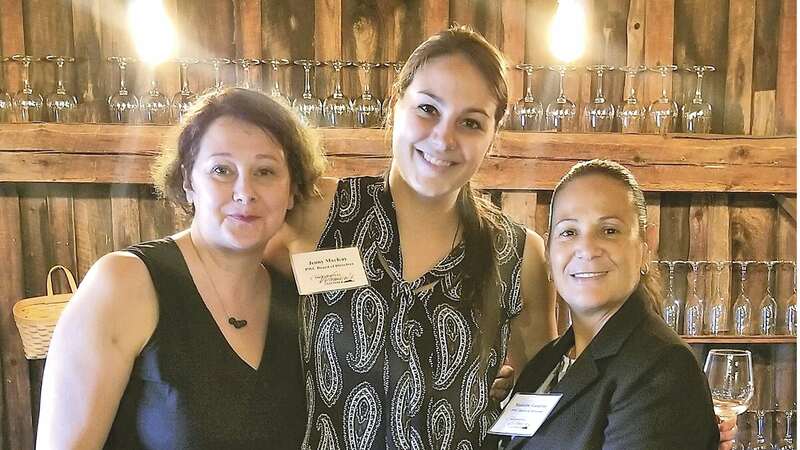 The Professional Women’s Chamber of Western MA, an affiliate of the Springfield Regional Chamber, hosted its first annual new-member event on June 28 at Glendale Ridge Vineyard in Southampton. This event brought together professional women from all specialties and backgrounds to network and learn more about the benefits of becoming a member of the Professional Women’s Chamber. Attendees also had the opportunity to sample wines and learn more about the vineyard from host Mary Hamel, co-owner of the Vineyard. 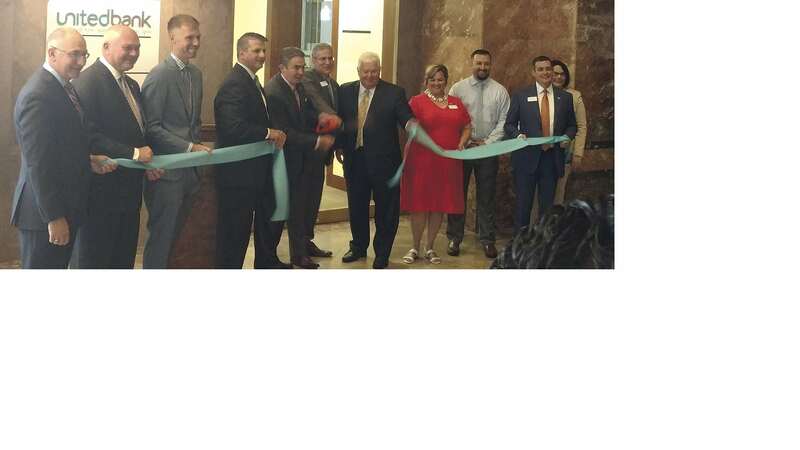 Springfield Mayor Domenic Sarno, Paul Picknelly, president of Monarch Enterprises, and Jeff Lomma, member services director of the Springfield Regional Chamber of Commerce joined members of the United Bank team for a ribbon-cutting ceremony at the bank’s new location at Monarch Place in downtown Springfield on June 28. Earlier this year, the bank moved its branch from 115 State St. into the first floor of One Monarch Place. June 28 marked the ceremonial opening of the new branch location. 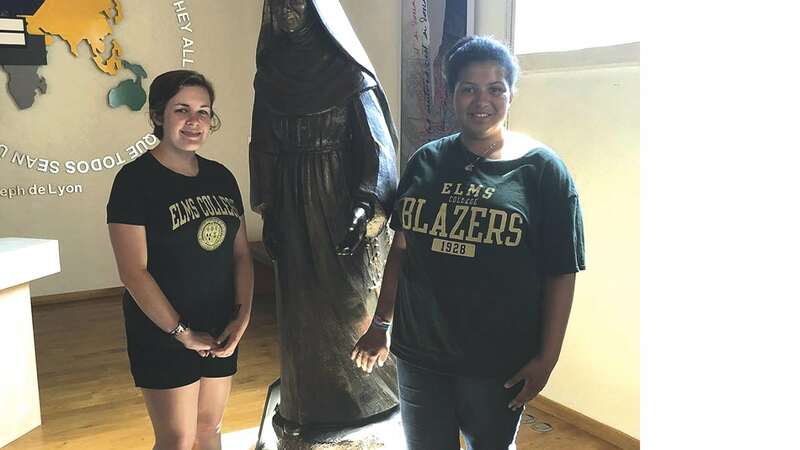 Two students from Elms College spent a week in France last month, practicing their French, learning about French history and culture, and — perhaps most importantly — making personal connections with the legacy of the college’s founders, the Sisters of St. Joseph. 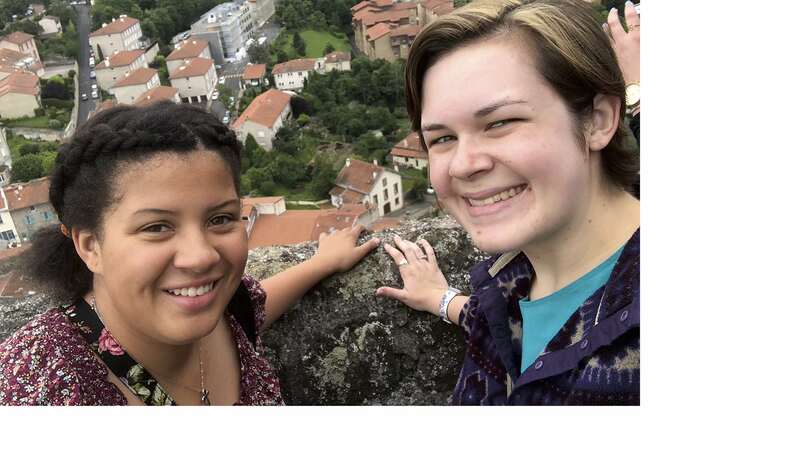 The week of June 16-23, Jane Dugan of Southwick and Monica Karriem of West Hartford, Conn. joined a pilgrimage to Le Puy, France, led by the Assoc. of Colleges of Sisters of St. Joseph (ACSSJ), of which Elms College is one of nine members. The group was led by Sr. Kitty Hanley and Sr. Joan Lescinski, along with Martha Malinski, executive director of the ACSSJ, and campus ministry representatives from some of the colleges. Dugan (left) and Karriem pose beside the statue of Mother St. John Fontbonne at the Sisters of St. Joseph Heritage Rooms in Lyon, France. For the second consecutive year, customers of Pride Stores and store management are showing support for Square One in a very big way. Pride recently staged a campaign where customers were encouraged to purchase a Square One ‘square’ for $1 at all Pride locations. Pride owner Bob Bolduc, one of BusinessWest’s Difference Makers for 2018, agreed to match all the donations, in support of the children and families served by Square One. 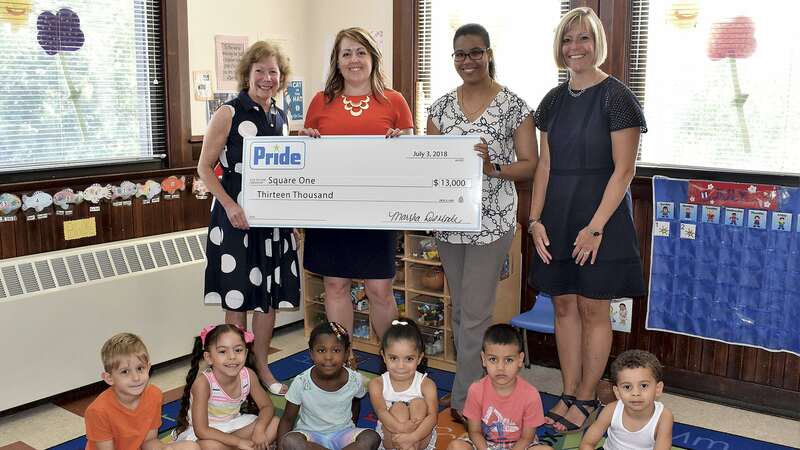 On July 3, surrounded by Square One preschoolers, Bolduc, along with his team, presented a check for $13,000 to the agency at its location at 255 King St. in Springfield. Bolduc meets with one of the young students.